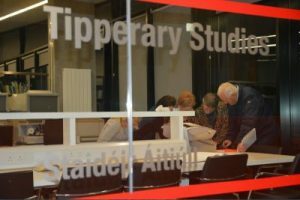 On Tuesday 14th February last a group of Silvermines Historical Society members visited the Tipperary Studies section at the Source Library in Thurles. As pre-arranged, the group met with Librarian, Mary Guinan Darmody who introduced them to all the resources available in centre. The archives are an invaluable resource for historians, students and for all wishing to undertake genealogical studies. The sources available included Tithe Applotment books, Griffith’s Valuations, Maps, Hearth Money Rolls, some Poor Law rate books and much more. How to use the microfilm to access the archives of local newspapers was demonstrated on the night by Mary Guinan Darmody, who gave the SHS group an excellent, comprehensive and informal talk on what is available. Tipperary Studies is located on the first floor of the the Source Library and Arts Centre, above Thurles branch Library, on Cathedral Street, Thurles. It is a purpose built archive with facilities that can cater for groups of up to 12 people, such as class or historical society visits. The Library is equipped with four microfilm readers and two public PCs, along with ample study and reading spaces.